The QuietSharp Glow provides the ultimate blend of performance, safety, and style for the classroom or studio. To make each pencil last a little longer and reduce classroom disturbing noise, the SharpStop system automatically shuts the sharpener down once the pencil is completely sharp. Then the unique SharpGlow light will come on, creating a soft blue glow around the dial to provide a visual indicator to the student and the teacher, who may not be close by. Its 6-size selector dial is perfect for a variety of pencils. Whether your classroom is full of elementary school students using a jumbo pencil or a Ticonderoga Tri-Write; or older learners who use standard pencils, this electric pencil sharpener has got you covered! And for ease of use, the Tip Saver Technology prevents over sharpening, extending pencil life. Once a pencil is completely sharp, the blade cutters will pull back and no further sharpening can be done. The giant shavings tray features our patented MagnaSafe tamper proof safety switch which shuts down the motor when the tray isn’t attached. So, if the tray is removed, there’s no way to get the motor to run. This makes it the standard for safety in a classroom environment with young children around. The unique curved shape and sleek brushed metal case offers class-leading style and classroom survivability. Antimicrobial Protected. SHARP GLOW ILLUMINATION - The ring around the sharpener's face lights up once the pencil is sharpened to a point. This allows the student as well as the teacher (who may not be closeby) to know that the pencil is ready for use! TOOL-FREE REMOVEABLE CUTTER CARTRIDGE for fast and easy cleaning or replacement. Never replace your sharpener. Just change out the blade if it gets dull. Check out our video for details. 10X LONGER CUTTER LIFE - The SharpGlow has an extra hardened helical cutter developed by Bostitch Engineers that allows for longer life without dulling. COLORED PENCIL COMPATIBLE - Lot of sharpeners make this claim but only we can back it up. Colored pencils have a bit of wax in them that can get caught up in the blade of any sharpener. 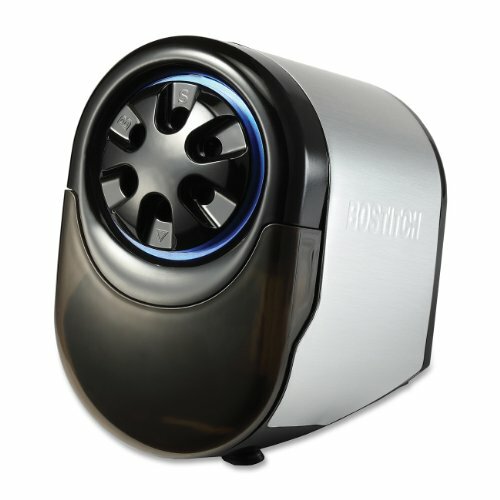 But since this electric pencil sharpener has a blade that you can access, simply remove the blade and wipe clean. It's that easy.